Lenovo did Google a pretty big favour this week, by taking the Motorola division off its hands. Now the Chinese PC maker is lending support in the proliferation of the Chrome OS with a pair of new notebooks. 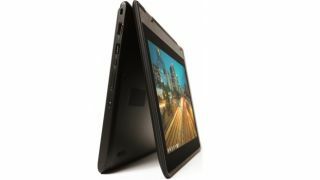 Lenovo has announced theThinkPad 11e series Chromebooks which include a flexible Yoga-branded convertible laptop/tablet hybrid, which operates in four positions, and a traditional clamshell laptop. The new Chromebooks are aimed at the education market and come with built-in protection against youths may be prone to chucking school bags around as if their parents hadn't spent a fortune on nice things. There's rubberised bumpers, reinforced ports and stronger hinges to protect from the "hustle and bustle of the classroom," Lenovo says. Aside from the kid-proofing, the 11e series Chromebooks feature an 11.6-inch display, while the Yoga has a wide-angled IPS touchscreen to boot. The devices promise all-day battery life and are powered by unnamed Intel processing configurations (which probably means they're pretty low-end). There's also an LED indicator which shows "wireless connectivity, laptop power or sleep mode to help teachers ensure consistent student activity," - in other words allowing teachers to check students aren't cyber loafing. Schools can also have them custom engraved to ensure those of dubious morals don't do a runner with them. The ThinkPad 11e series goes on sale this spring, starting at $349.